As we know that Buddhism religion is a very old religion. We provide different knowledge about Spread of Buddhism, Gautama Buddha, The Doctrine of Buddhism, Buddhist councils. 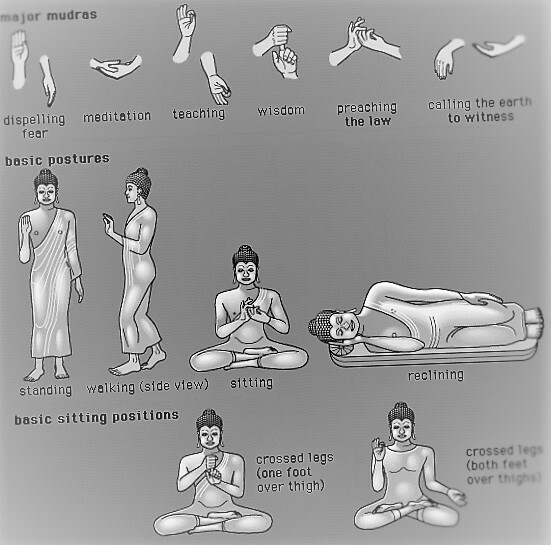 In this article we provide knowledge about Buddha Mudras,Different Mudras in Buddhism Religion etc. The Abhya Mudra (Mudra of no-fear) represents protection, peace, benevolence and dispelling of fear. In the Theravada, it is usually made with the right hand raised to shoulder height, the arm bent and the palm facing outwards with the figures upright and joined and the left hand hanging down while standing. In Thailand and Laos, this Mudra is associated with the walking Buddha, often shown having both hands making a double Abhaya Mudra that is uniform. The Mudra was probably used before the onset of Buddhism, as a symbol of good intentions proposing friendship, when approaching strangers. This gesture calls upon the Earth to witness Buddha’s enlightenment at Bodhgaya. A seated figure’s right hand reaches towards the ground, palm inwards. The Dharmachakra Mudra represents a central moment in the life of Buddha, when he preached his first Sermon after his enlightenment in the Deer Park in Sarnath. In general, only the Gautama Buddha is shown making this Mudra. This Mudra position represents the turning of the wheel of the Dharma. The Dhyana Mudra (meditation Mudra) is the gesture of meditation, concentration and Good Law. The two hands are placed on the lap, the right hand on the left with the fingers fully stretched, four fingers resting on each other and thumbs facing upwards towards one another diagonally, palms facing upwards; in this manner, the hands and fingers from the shape of triangle, which is symbolic of the spiritual fire or the Triratna (the three jewels). This Mudra is used in representations of the Sakyamuuni Buddha and Amitabha Buddha. Sometimes, the Dhyana Mudra is used in certain representations of Bhisajyaguru as the Medicine Buddha. The Varda Mudra (favourable Mudra) signifies offering, welcome, charity, giving, compassion and sincerity. It is mostly shown made with the left hand by a revered figure devoted to human salvation from greed, anger and delusion. It can be made with the arm crooked and the palm offered slightly turned up or in the case of the arm facing down the palm presented with the fingers upright or slightly bent. The Varada Mudra is rarely seen without another Mudra used by the right hand typically the Abhya Mudra. It is often confused with the Vitarka Mudra, which it closely resembles. The Vajra Mudra (thunder Mudra) is the gesture of knowledge. It is made by forming a first with the right hand, index extending upwards and the left hand also making a fist and enclosing the index. A good example of the application of the Vajra Mudra is the 7th technique (out of nine) of the nine syllable seals, using the Mudra with mantras in a ritual application. The Vitarka Mudra (Mudra of discussion) is the gesture of discussion and transmission of Buddhist teaching. It is done by joining the tips of the thumb and the index together and keeping the other fingers straight very much like the Abhaya and the Varada Mudra, but with the thumbs touching the index fingers. 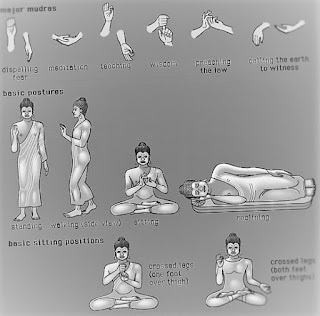 This Mudra has a great number of variants in Mahayana Buddhism in East Asia. A 2010 nameless Kannada language film directed by Upendra was originally depicted by this Mudra, which later came to be known as super. The Gyana Mudra (Mudra of knowledge) is performed by touching the tips of the thumb and the index together, forming a circle and the hand is held with the palm inwards towards the heart. The Karana Mudra is the Mudra, which expels the demons and removes obstacles such as sickness or negative thoughts. It is made by raising the index and the little finger and folding the other fingers. It is nearly the same as the gesture known as corna in many western countries, the difference is that in the Karana Mudra, the thumb does not hold down the middle and ring finger. This Mudra is also known as tarjani Mudra.